Purpose: To strengthen the believers in Ephesus in their Christian faith by explaining the nature and purpose of the church, the body of Christ. Setting: The letter was not written to confront any heresy or problem in the churches. It was sent with Tychicus to strengthen and encourage the churches in the area. Paul had spent over three years with the Ephesian church. As a result, he was very close to them. Paul met with the elders of the Ephesian church at Miletus (Acts 20:17-38) - a meeting that was filled with great sadness because he was leaving them for what he thought would be the last time. Because the letter contains no specific references to people or problems in the Ephesian church and because the words "in Ephesus" (1:1) are not present in some early manuscripts, Paul may have intended this to be a circular letter to be read to all the churches in the area. 1. Romans 3:24. We are justified (declared "righteous"). 2. Romans 8:1. No condemnation awaits us. 3. Romans 8:2. We are set free from the power of sin that leads to death. 4. 1 Corinthians 1:2. We are sanctified (made holy) in Jesus Christ. 5. 1 Corinthians 1:30. We are pure and holy in Christ. 6. 1 Corinthians 15:22. We will be given new life at the resurrection. 7. 2 Corinthians 5:17. We are new persons. 8. 2 Corinthians 5:21. We are made right with God. 9. Ephesians 1:3. We are blessed with every spiritual blessing in Christ. 10. Ephesians 1:4. We are holy and without fault. 11. Ephesians 1:5. 6. We are adopted as God's children. 12. Ephesians 1:7. Our sins are taken away, and we are forgiven. 13. Ephesians 1:10, 11. We will be brought under Christ's authority. 14. Ephesians 1:13. We are identified as belonging to God by the Holy Spirit. 15. Ephesians 2:6. We have been raised up to sit with Christ in the heavenly realms. 16. Ephesians 2:10. We are God's masterpiece. 17. Ephesians 2:13. We have been brought near to God. 18. Ephesians 3:6. We share in the promise of blessing through Christ. 19. Ephesians 3:12. We can come boldly and confidently into God's presence. 20. Ephesians 5:29, 30. We are members of Christ's body, the church. 21. Colossians 2:10. We are made complete in Christ. 22. Colossians 2:11. We are free from our sinful nature. 23. 2 Timothy 2:10. We will have eternal glory. Christ is exalted as Head over all. We have life and power in Him. Unity is to be maintained. We love and minister to each other and live together righteously. Richards, L., & Richards, L. O. (1987). The teacher's commentary. Includes index. (928). Wheaton, Ill.: Victor Books. Richards, L., & Richards, L. O. (1987). The teacher's commentary. Includes index. (929). Wheaton, Ill.: Victor Books. * Note that Peter speaks of relationships with persons who are not within the church. 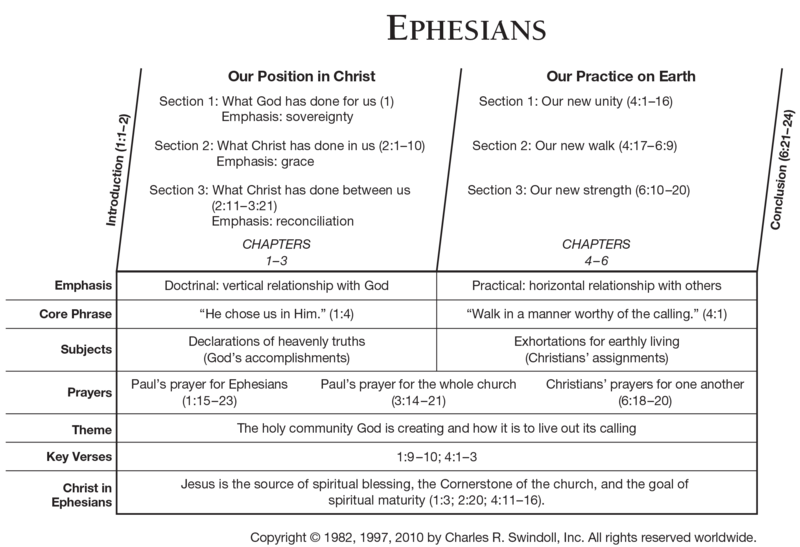 Ephesians and Colossians speak of relationships within it. Richards, L., & Richards, L. O. (1987). The teacher's commentary. Includes index. (930). Wheaton, Ill.: Victor Books. New Geneva study Bible. 1997, c1995 (electronic ed.) (Ef 1.14). Nashville: Thomas Nelson. New Geneva study Bible. 1997, c1995 (electronic ed.) (Ef 1.15). Nashville: Thomas Nelson. In this letter, Paul explains the wonderful things that we have received through Christ and refers to the church as a body to illustrate unity of purpose and show how each individual member is a part that must work together with all the others parts. In our own life, we should work to eradicate all backbiting, gossip, criticism, jealousy, anger, and bitterness, because these are barriers to unity in the church. We are engaged in a spiritual battle - all believers find themselves subject to the devil's attacks because they are no longer on the devil's side. Thus, Paul tells us to use every piece of God's armor to resist the devil's attack and to stand true to God in the midst of those attacks. Belt Truth The devil fights with lies, and sometimes his lies sound like truth; but only believers have God's truth, which can defeat the devil's lies. Body armor Righteousness The devil often attacks our heart - the seat of our emotions, self-worth, and trust. God's righteousness is the body armor that protects our heart and ensures his approval. He approves of us because he love us and sent his Son to die for us. Shoes Peace that comes from the Good News The devil wants us to think that telling others the Good News is a worthless and hopeless task - the size of the task is too big and the negative response are too much to handle. But the shoes God gives us are the motivation to continue to proclaim the true peace that is available in God - news everyone needs to hear. Shield Faith What we see the devil's attacks in the from of insults, set backs, and temptations. But the shield of faith protects us from the devil's arrows. With God's perspective, we can see beyond our circumstances and know that ultimate victory is ours. Helmet Salvation The devil wants to make us doubt God, Jesus, and our salvation. The helmet protects our mind from doubting God's saving work for us. Sword Word of God The sword is the only weapon of offense in this list of armor. There are times when we need to take the offensive against the devil. When we are tempted, we need to trust in the truth of God's Word.